Technique is an important skill and you have bought the best electric knife for your needs, but a poorly sharpened knife can make even the best chef look bad. A dull knife can ruin the appearance of tomatoes, bread slices, and certainly meat. It can contribute to longer prep work, muscle strain, and even set you up for injury from cuts. 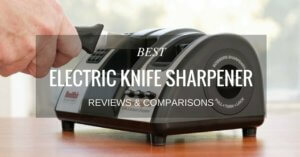 The following are our picks for what we consider to be the best electric knife sharpeners on the market. 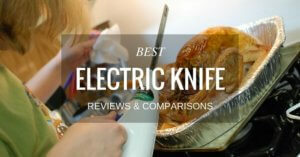 Which Is The Best Electric Knife Sharpener? This model comes in at the highest price point. The 3 stage system has diamond abrasives, hardened miniature steel and a flexible stropping disk. This “all-in-one” sharpener, steel and strop model gives you a factory sharp edge to most electric, straight edge, or serrated knife blades, each and every time. Angle guides provide a 20 degree sharpening angle that helps provide the best edge for your knives. The model measurements are 10” x 10” x 4” and comes with a3 year limited warranty. The “PETec” in this model stands for “precision edge technology” and this electric knife sharpener delivers. Be careful; your knife will be sharp when you are done, as one previous customer could attest to after having to receive stitches to his finger. This German engineered, made in America, 3 stage sharpening unit works well on both straight and serrated blade edges, using a 14 degree sharpening angle. It measures 12” x 6” x 6” and comes with a 3 year warranty. The variable speed motor on this sharpener hones not only your kitchen knives but will sharpen scissors and tools as well. It is portable enough to take with you on the job, whether you are a cook or a carpenter, measuring only 5.5” x 10” x 6”. 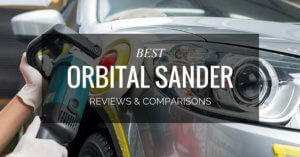 Warranty on this model is only 1 year, but its’ flexibility still makes it a great choice. 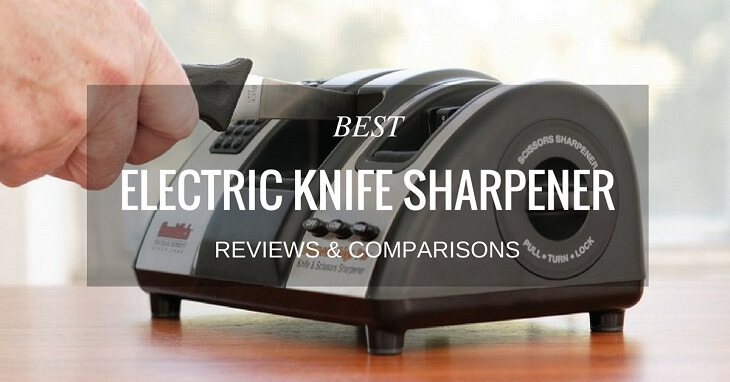 This is the best rated electric knife sharpener. Priced at a low cost, it still comes with a 3 year warranty. At least one costumer stated that this model is excellent for repairing damaged blade edges. Unfortunately it is not suitable for sharpening scissors. Ait is a very aggressive sharpener that does not have an adjustable angle’ so it may not be suitable for all types of knives either. Check the manufacturer’s suggestions that came with your electric knife on whether you can utilize this model for your needs. Aside from the low price other good points for this electric sharpener include its ease of use and its portable size. It weighs in at 2.4 pounds and measures a mere 8.2” x 7” x 6.2”. This is the lowest priced model. Don’t let that discourage you in way however; One happy customer, a Cajun cook, says he was sure his onions were cowering in the fridge; this sharpener got his blades that sharp. This model provides a 2 stage system for sharpening non-serrated blades only; precision grinding and fine honing. It has a non-adjustable angle but it automatically holds each knife at the correct angle, ensuring precise sharpened edges. This model is another that does not sharpen scissors. The sapphirite sharpening wheels are the same quality material used by professional knife sharpeners. Perhaps that is why the Cajun cook had his own knives so worried, and why he was so happy. Coming in at 2.8 pounds and measuring 9.9” x 7.2” x 4.8” this lower priced sharpener comes with a 1 year limited warranty. As usual this decision all depends upon what your individual needs are, and so only you can answer that question.We have our favorites of course but every cook is different, their needs are different, and so ultimately each of you will have your own favorites. The electric knife sharpener reviews left by previous customers are a great way to get a feel for how each sharpener worked in real life scenarios. Aside from that we have broken the facts down in to more point form chunks, based upon factors that matter most to you. Chef’s Choice 130 Professional Knife-Sharpening Station, Platinum = 3 year. Wusthof Black 3-stage Chef’s Choice PEtec Electric Knife Sharpener = 3 year. ​Work Sharp WSKTS-KO Knife and Tool Sharpener Ken Onion Edition = 1 year. ​Mcgowan Firestone Electric Sharpener, Black/Red = 3 year. Presto 08800 EverSharp Electric Knife Sharpener = 1 year. 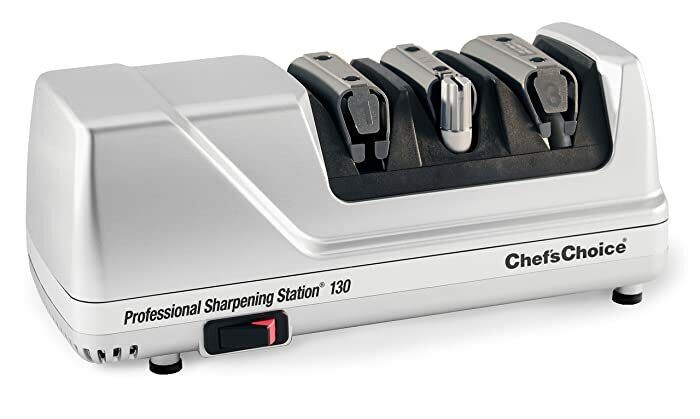 Chef’s Choice 130 Professional Knife-Sharpening Station, Platinum = serrated or straight. Wusthof Black 3-stage Chef’s Choice PEtec Electric Knife Sharpener = straight or serrated. 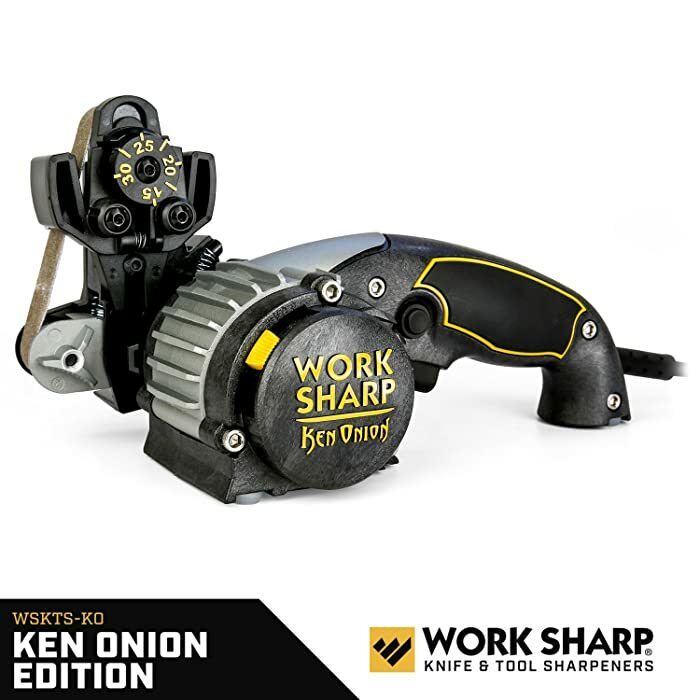 ​Work Sharp WSKTS-KO Knife and Tool Sharpener Ken Onion Edition = anything with a blade. 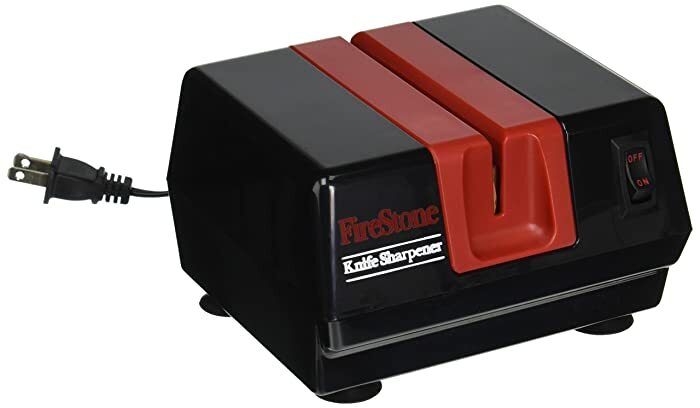 ​Mcgowan Firestone Electric Sharpener, Black/Red = flat or one side serrated. 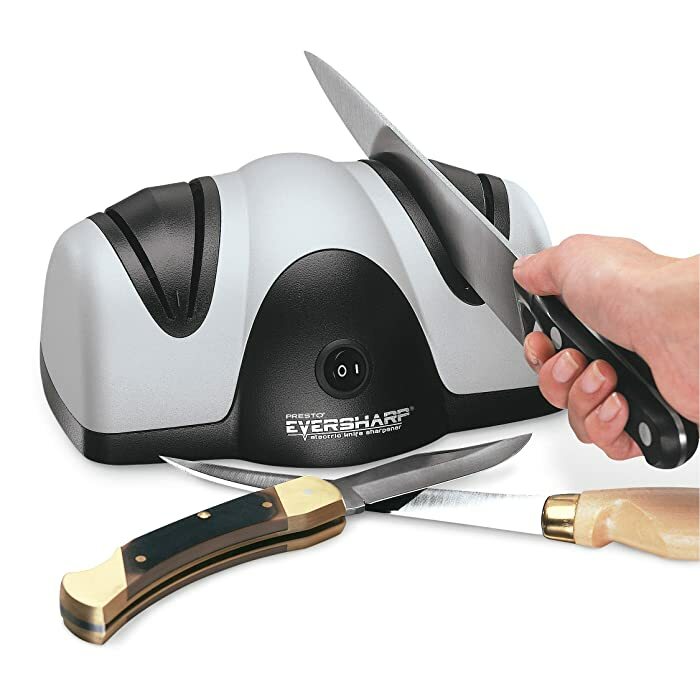 Presto 08800 EverSharp Electric Knife Sharpener = non-serrated only. Chef’s Choice 130 Professional Knife-Sharpening Station, Platinum = high price. 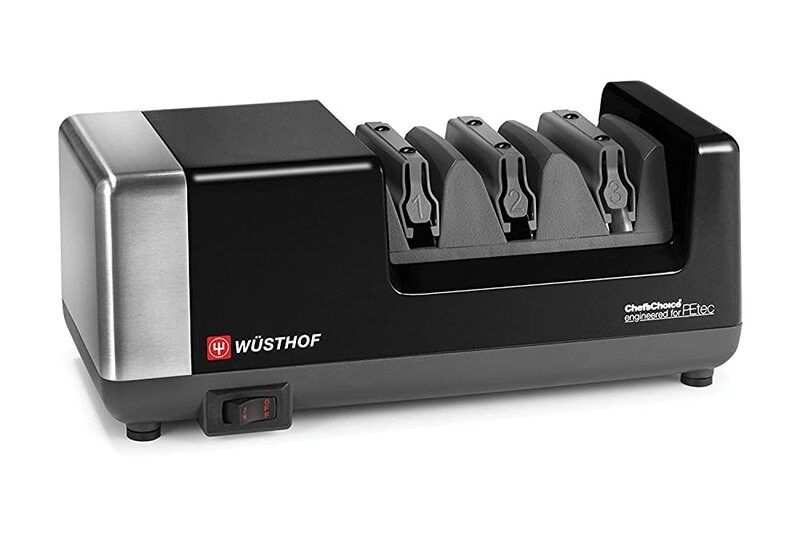 Wusthof Black 3-stage Chef’s Choice PEtec Electric Knife Sharpener = only a 14 degree sharpening angle. 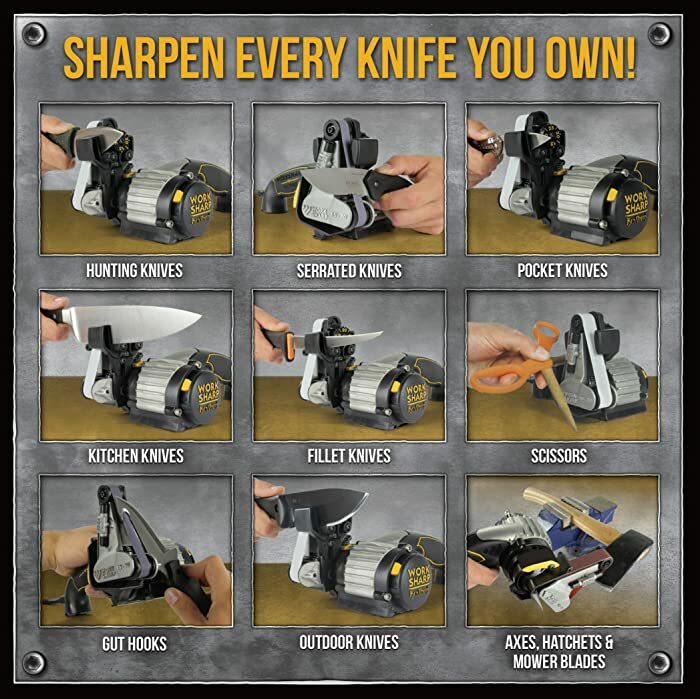 ​Work Sharp WSKTS-KO Knife and Tool Sharpener Ken Onion Edition = short 1 year warranty. 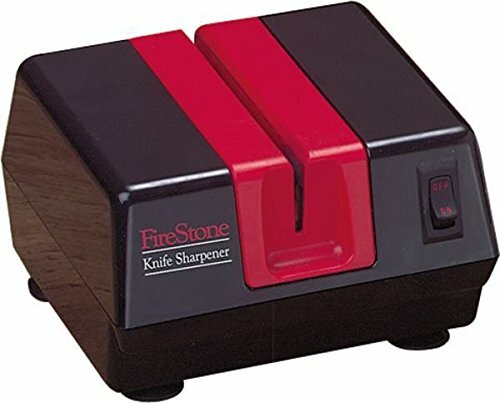 ​Mcgowan Firestone Electric Sharpener, Black/Red = non-adjustable sharpening angle. 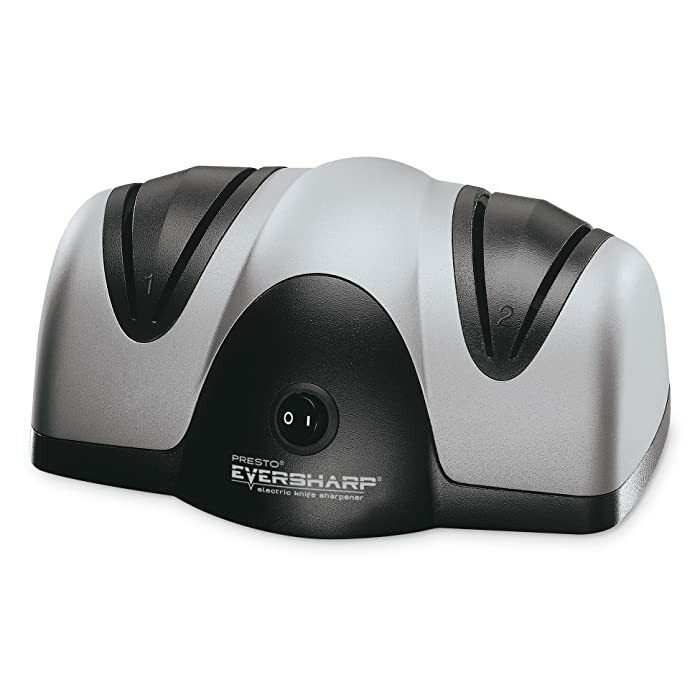 Presto 08800 EverSharp Electric Knife Sharpener = 1 year warranty; non-serrated blades only. This model is reasonably priced and it will sharpen both serrated and straight blade knives. Just about every kitchen owns at least one of each so it only makes sense to have a sharpener that can handle both types. The fact that it comes with a 3 year warranty is definitely a great selling point as well. 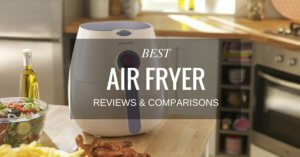 This one was an easy pick; we let the consumers decide; with an overall rating of 4.9 out of 5 stars. This model also comes with a 3 year warranty, a fact that other people who have purchased this sharpener obviously appreciate. Though this sharpener only comes with a 1 year warranty it is very affordable. Many households today simply cannot afford the pricier models, but every home chef deserves properly sharpened knives. This model uses the same material as the professionals use in the sharpening wheels. This mid ranged price sharpener gets to be our #1 pick because it will sharpen just about anything. From any type of kitchen knife, to scissors and tools, this model will help out not only the kitchen cook but the handyman and crafter as well. It may only come with a 1 year warranty but it also comes with the recommendations of some very happy customers. Every cook deserves the best kitchen tools available, and every cook deserves the best knives. If you own an electric knife (and we can’t imagine life without one) it will only perform well for you if it is kept sharp. You truly cannot go wrong with any of these models of electric knife sharpeners, so the choice is up to you. Whatever your needs are in the kitchen, and around the home, we know you will be happy.